Bangalore once had 117 lakes! Though in the recent years the number has dwindled, a few that are left add to the beauty and ecology of the city. Read more about Bangalore’s lakes. Adjoining Hebbal flyover, this lake provides vital lung space in an otherwise concrete jungle. Spread over an area of 150 acres, this lake is as old as Bangalore city. It is a natural lake maintained by the Forest department. The lake attracts migratory birds from Himalayan and Central Asian regions and is home to 70 species of water birds and a huge variety of aquatic vegetation. In the recent years, the lake has been in the news for the controversial public private partnership policies by the Lake Development Authority of Bangalore. Boating facilities and a beautiful park are the attractions for a leisurely evening out. Ulsoor lake is situated in Bangalore Cantonment near MG Road and faces the army’s MEG regiment. It is an elegant lake spread across 1.5 square kilometers, dotted with a few islands and is a venue for immersion of idols during the popular Ganesha festival in August-September. In recent years, the authorities have constructed a separate tank for idol immersion, so that the lake itself does not get contaminated. You can go boating here or just take a swim in the recreational complex near the lake. 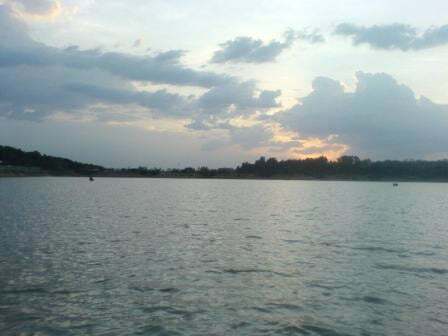 Sankey Tank is actually a man-made lake situated in the Malleswaram – Sadashivnagar area. 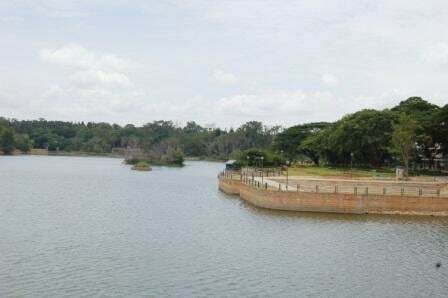 The lake was a creation of Colonel Richard Sankey of the MEG Regiment to meet the water supply needs of North Bangalore. Spread across an area of 15 hectares and surrounded by forest area and a well maintained park, the lake looks surreal during misty winter mornings and also contributes to the cool breeze in hot and sunny days. The Forest Department provides boating facilities to visitors. The Nagavara Lake, situated near Hebbal on Outer Ring Road, is a lake with a difference. The place has been leased to Lumbini Gardens (a private organization) and offers a variety of amusement rides for kids on the banks of the lake. The lake has a steady stream of visitors everyday and can be called as a water based theme park rather than a lake. The main attraction of this amusement park is a huge artificial wave pool. You can peddle-boat or go in a ‘coffee boat’ across the lake. The area is well maintained with a well stocked food court and clean walkways. This is an ideal place to go with your kids on the weekend. Lying between bustling Koramangala and H.S.R. Layout in South Bangalore, Agara lake is a picture of tranquility. Its 39.58 hectares of greenery and water, which attract a variety of birds – dicks, coots, moorhens, herons, egrets, kites and kingfishers. The lake has recently shot up in controversy due to the Lake Development Authority’s plans of leasing the lake maintenance to a private company. The residents and naturalists are concerned that the eco-system will be threatened due to the pollution if the private company creates a amusement park beside the lake. Sachidanandanagar residents had to resort Gandhigiri again in less than seven months, to make sure they got the remaining khatas and plan sanctions. From the being the fabric of the royalty to going contemporary Hakoba has remained relevant. With affordable pricing it has a wider appeal too.